Props, shafts, rudders, struts, and zincs need love, too. Inspect yours after your boat’s been hauled. Unless you’ve dragged your props over an oyster bed and dog-eared the blades recently, chances are you’re not thinking much about your running gear—the props, shafts, struts, and rudders that combine to push (sometimes pull) your boat hither and yon over the sea. But “out of sight, out of mind” isn’t the way to maintain this most important system. 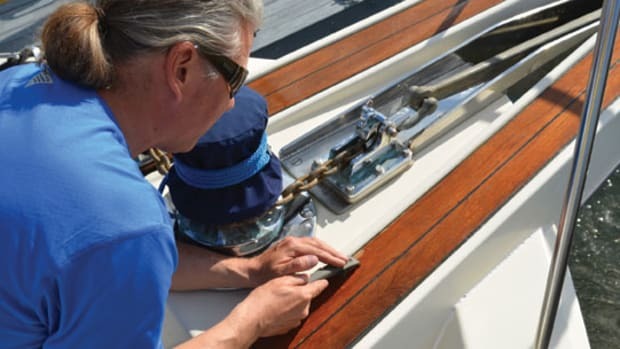 Now that your boat’s coming out of the water for the winter—or, if you’re lucky, getting short-hauled before heading toward tropical climes—it’s a perfect opportunity to inspect that important stuff under the boat, and maybe arrange for some tuning-up during the off-season. Most yards insist on doing all hull and bottom work themselves, so this will be an expedition of inspection, not repair. Most problems you’ll find won’t be do-it-yourself jobs anyway: Have you ever tried pulling a recalcitrant prop, or knocking out a strut bearing? You need special tools and expertise. If you discover anything unusual, ask your yard manager, surveyor, or other expert to check it out. Serious prop damage shows up right away, in excessive vibration, reduced performance and/or increased fuel burn, symptoms that are hard to miss during the season. But some prop problems are more subtle—damage from cavitation, for example. Cavitation develops when the pressure on the suction (forward) side of the propeller drops so low the water starts to vaporize, generating bubbles of basically boiling water that cling to the blades until they’re either spun off or collapse. When the bubbles collapse, they erode the surface of the metal, creating pitting that can easily be mistaken for galvanic corrosion. Here’s the giveaway, though—cavitation only occurs on the forward face of the blades, usually near the tips. 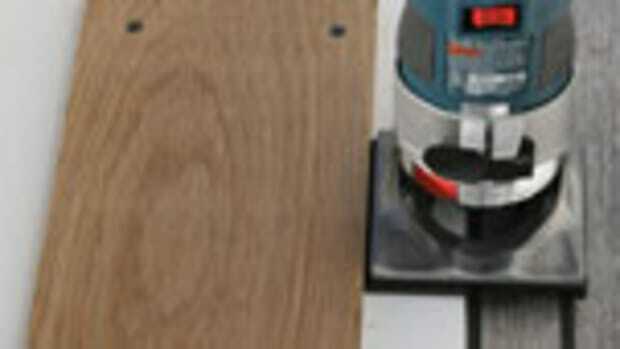 Cavitation is caused by excessive blade loading—too much horsepower for the area of the blades. That’s why fast boats with big engines spin four-, five- or even six-bladed props, to add blade area without increasing prop diameter, thereby reducing loading to acceptable levels. Even if your boat’s been fine up until now, cavitation can arise from minor damage to the blades; increased boat weight (you know, you’ve added a lot of gear over the years); or added resistance from other conditions, maybe a dirty bottom. It’s also more likely if you’re heavy on the throttles. If you find prop damage you suspect is from cavitation, consult your yard manager, who may suggest calling in a propeller pro. The remedy is two-fold: Repair the damage to the prop, and locate the cause so it doesn’t happen again. A good prop shop can analyze your boat’s performance from data you provide, measure your prop to verify its specs (props are often not exactly the diameter and pitch that are stamped on the hub), and maybe recommend adjusting the props in accordance with how your boat has changed, e.g. gained weight, over the years. While you’re inspecting the props, check your rudders (they can suffer from cavitation, too) and shafts, in particular the bearings in the struts or stern tubes. Some folks, including many boating writers, incorrectly call these “cutlass” bearings, but they are really “cutless” bearings, or, more properly, Johnson Cutless bearings, the brand name of the industry leader. (See “Nothing to Do with Pirates”) Comprised of a nitrile rubber lining in a brass or reinforced plastic sleeve, cutless bearings rely on water flowing through fore-and-aft grooves in the lining: The spinning prop shaft actually hydroplanes on a thin cushion of water, reducing friction to almost nothing. 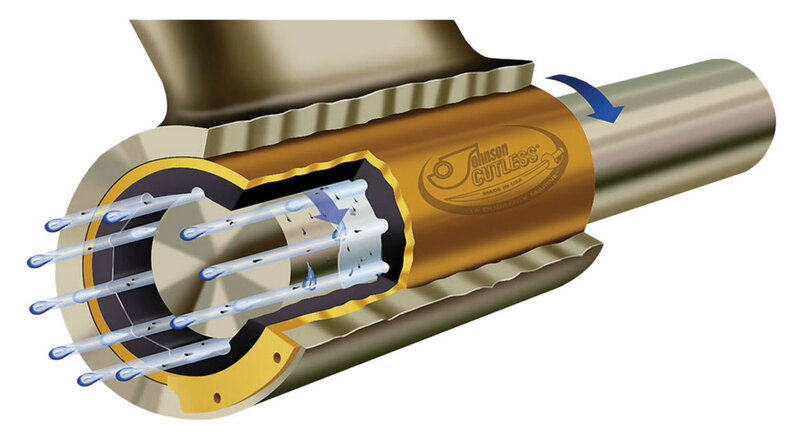 Duramax Marine (www.duramaxmarine.com), the manufacturer of Johnson Cutless bearings, calls this the “Water Wedge” principle. In order for the wedge to develop, there has to be a little clearance between the shaft and the rubber lining, so even when the bearing is new, the shaft will wiggle slightly. 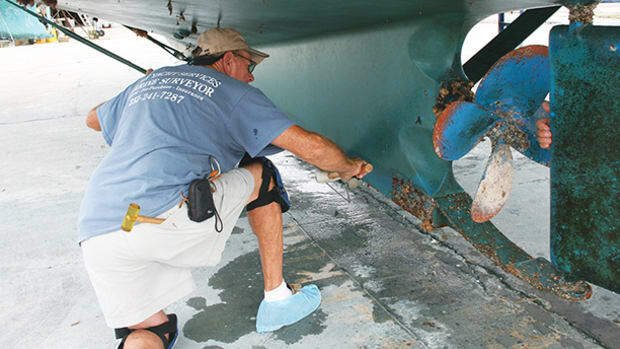 Inspect the cutless bearing’s water grooves for marine growth, fishing line, or other obstructions that will block water flow, and check for excessive wear of the bearing by measuring the depth of the grooves. The tech experts at Duramax Marine recommend replacement when the rubber lining is half gone, a finding that’s, again, indicated by the depth of the grooves. Measure the depth at the bottom of the bearing, under the shaft (the weight of the shaft won’t compress the rubber appreciably, according to the Duramax experts), and compare with the grooves at the top. The wear occurs at the bottom of the bearing because that’s where the shaft rubs against the lining before the Water Wedge develops; once the shaft is spinning, it doesn’t touch the lining at all. Measure at both the forward and after ends of the bearing, too: If the wear is different, it could be the strut and shaft are misaligned. Investigate further by checking clearances with feeler gauges, and if you come up with an issue or issues, call your yard manager for advice. In a perfect world, props, shafts, struts, and rudders would be made of electrically inert, high-strength, impact-resistant, space-age plastic—but if this stuff exists, NASA isn’t giving us any. So, unfortunately, we still have to deal with bronze, Monel, Nibral and other metals, all of them susceptible to galvanic corrosion. 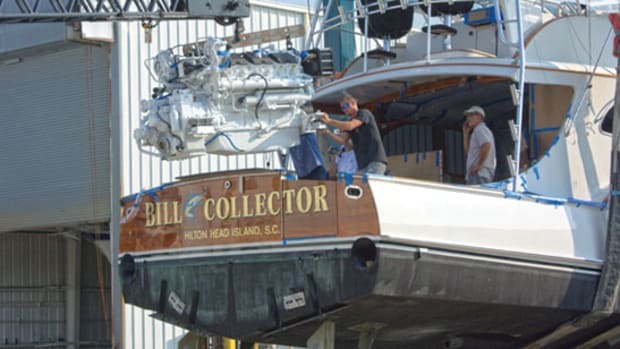 The causes and prevention of galvanic corrosion comprise a complex subject, and one that’s been covered frequently here at Power & Motoryacht. But you can tell if your underwater gear’s in danger simply by looking at last year’s zincs. 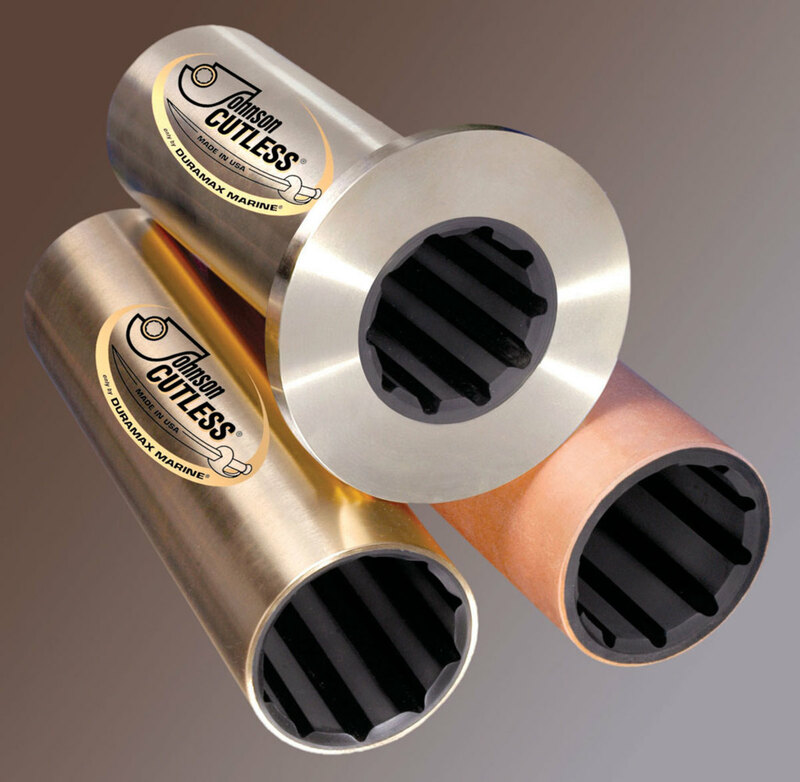 Okay, let me correct that: Although everyone in the boating world calls them “zincs,” sacrificial anodes that protect underwater metal can be made of zinc, aluminum, magnesium, or a combination; aluminum-zinc alloys work best for most applications. 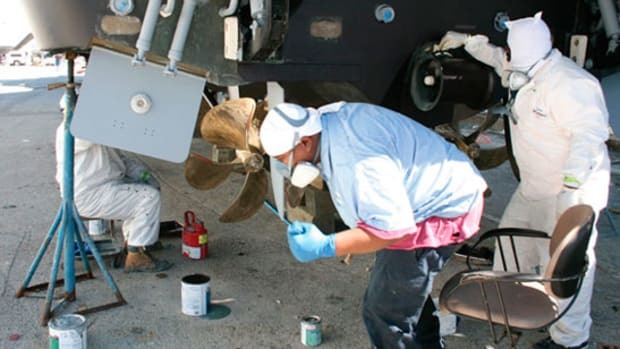 Replace anodes at relaunch in the spring, at least once a year if your boat lives on the water, or whenever they’ve lost more than half their metal. Some anodes, like the Premium Navalloy range from Performance Metals (www.performancemetals.com), have a built-in indicator that appears when it’s time for replacement. (Navalloy is an alloy of aluminum, zinc, and indium, an expensive rare metal; the alloy meets mil-spec and ABYC standards.) If you keep your boat in the water year-round, take a swim and check your anodes every couple of months. Or have a diver do it. Of course, the fault may not be in your boat, but in your neighbor’s. 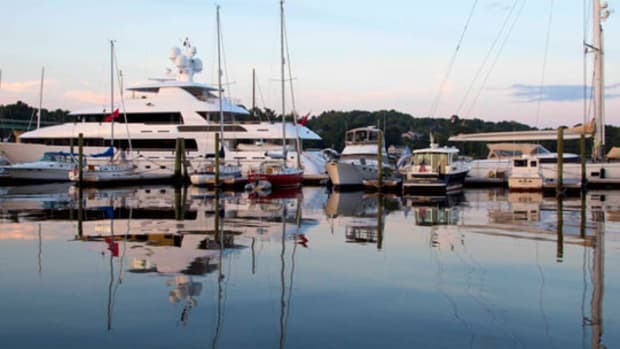 When you plug into a marina’s shore power system, you attach your boat to every other boat through the grounding system. 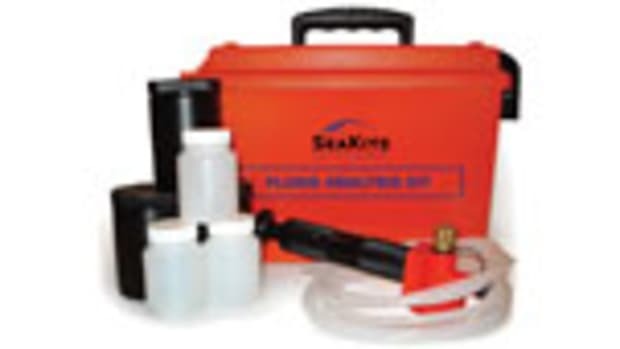 If another boat, or the shore power wiring itself, has an issue, it can energize your boat’s bonding system (the AC ground and DC ground are connected, per ABYC standards) and gobble up anodes. You probably have a galvanic isolator in your shorepower wiring to prevent this—if not, install one now—but isolators can fail. Have your corrosion pro test yours. If you want to go top-shelf, replace your isolator with an isolation transformer, which not only prevents grounding issues but also regulates AC voltage and protects your boat against power surges. I have no data on this, but I’ll wager that 90 percent of corrosion problems start with shore power issues, so protect yourself with isolation. Just remember, when checking your boat after a haulout, put on your paranoid, “better-safe-than-sorry” hat. It’s a lot easier to maintain props, shafts, struts, rudders, and bearings when your boat’s on the hard, as opposed to when she’s back in the water. And don’t forget those “zincs” either.